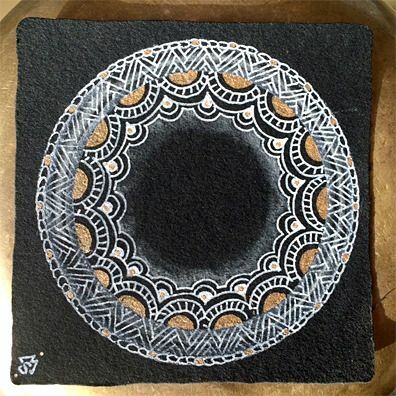 With Bijou's help, we have begun a fun series of blog posts on BLOG Zentangle called "Bijou's Twelve Days of Christmas." Enjoy the content and great comments; add your own comment to be part of a daily random drawing of gifts. On the first day, Bijou gave to me . . .
On the second day, Bijou gifted me . . .
On the third day, Bijou sent to me . . .
On the fourth day, Bijou bestowed on me . . .
On the fifth day, Bijou toasted me . . .
Bijou (and we) look forward to spending the next few days of this season with you all! Also, we recently received some wonderful emails that we just had to share. Just wanted to share this with you. 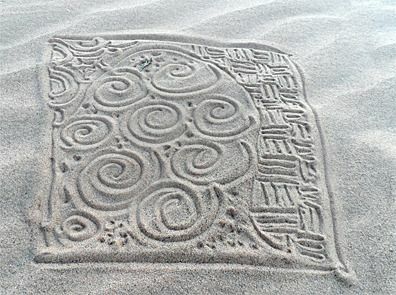 My student drew this in the sand when in the Sahara desert!! Her name is Laura. Maybe you could post for others to see? Thank you. I just have to share this! I've been battling severe PTSD for a long time and discovered Zentangle. Since, I've shared it with my case manager, my psychiatrist and therapist! You'll never guess how much happiness Zentangle has brought to my life. Thanks always for the treasure you put into our hands (and minds!). I�d love to share with you this wonderful story, that happened to me on past november 21st. 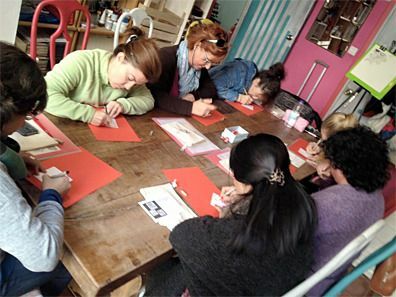 This day, I taught a 101 Z workshop in Granada, a beautiful town in the south of Spain. One of the ladies was nearly blind. She can see only with one eye 15%. And she could do this Zentangle with an 05 Micron. She is a Champion, and a very brave woman. She told me "Heaven is the l�mit, for me. I join and try everything. And later, If i can't do it, at least I've tried to do it." She enjoyed a lot during the Z workshop, and ask me to call her again, for the next workshop, in two or three months. I appreciate everyday I can do this work with such a wonderful people. I commented recently on your blog with some of the stands I use for my tiles throughout the house. I brought out some christmas balls early to show the seasonal decor. 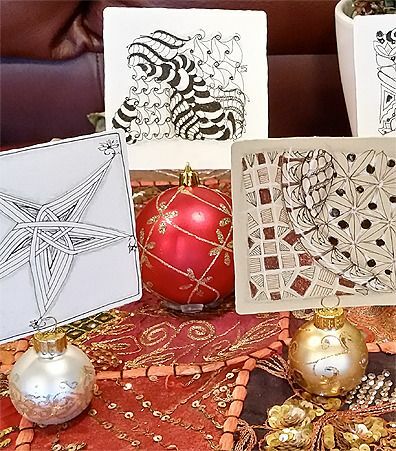 To celebrate this season and to help make your Zentangle gift extra special, Maria will hand-letter a gift card to accompany your Zentangle purchase. This is available through the end of the year. Just tell us the names you want for the "to" and the "from" in the Comment section as you check out online or tell us when you call in your order, but please, no long notes, just names. 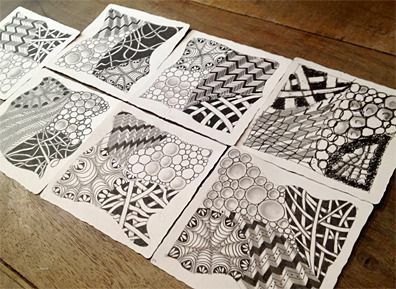 Our Certified Zentangle Teacher (CZT) seminars for 2016 are nearly full. We have just a few seats remaining. For more information, please see this link. To all who have signed up, we look forward to meeting and working with you soon! Thank you for sharing this amazing adventure with us and with each other. We wish you and your family the very best at this holiday season and always.